Even from outside, Kerry Kane and David Scarpa’s house stands out. The 1940s American colonial revival feels almost exotic among the bungalows in Santa Monica. 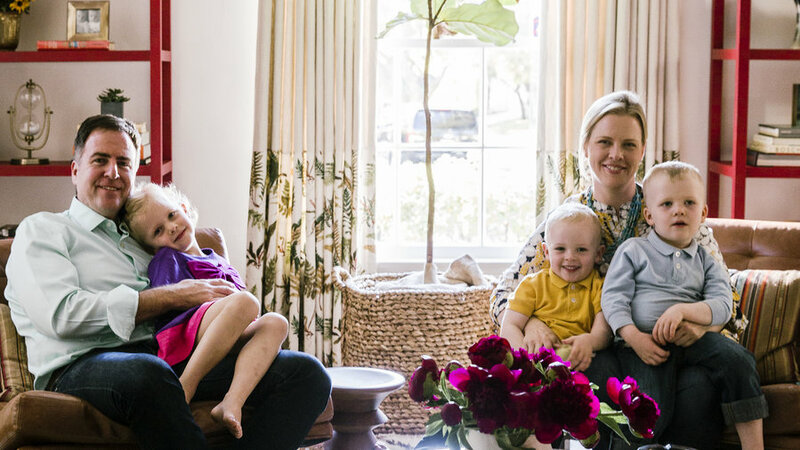 But the familiar white house with black shutters felt like the perfect place to raise their “Irish triplets”—5-year-old daughter Dahlia and 4-year-old twins Rex and Dean. Bold elements—graphic wallpaper, taxidermy, multicolor upholstery fabric—respect the home’s origins while feeling fresh enough to coexist with the modern pieces the couple already owned. 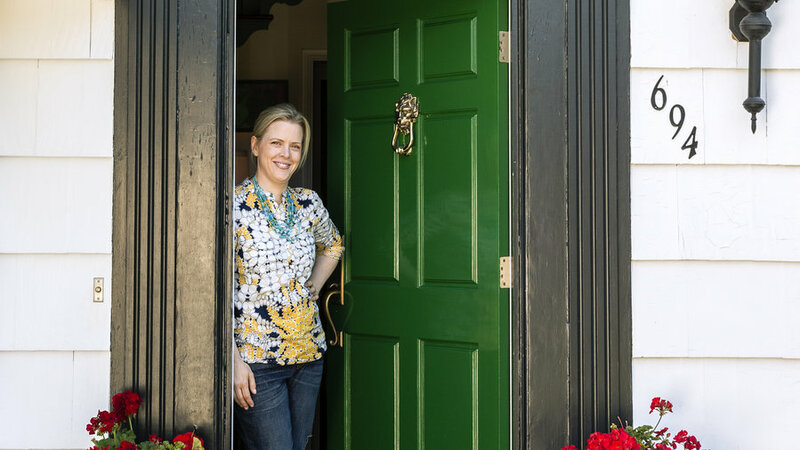 Instead of standard-issue colonial red, the family’s front door is painted kelly green. “I wanted something a bit more organic that would tie into the trees,” Kane says. The original molding surrounding the door pops even more when painted black. “You get that this house is young and fun, but also in line with the architecture,” says designer Frances Merrill. Door paint: Bottle Green 3022; finepaintsofeurope.com. In the entryway, the family stashes shoes, dog leashes, and other coming-and-going items in an old marble-topped dresser Merrill found at an antiques mall. “It’s perfect,” Kane says. 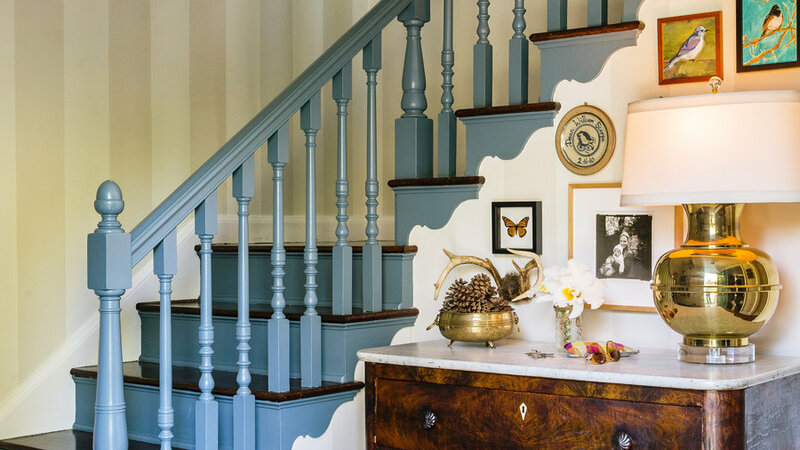 “I never worry about the kids running their toys into something that was already a little beat up.” The Indian soumak rug pulls in the blue of the banister. Banister paint: Hamilton Blue PM-6; benjaminmoore.com. 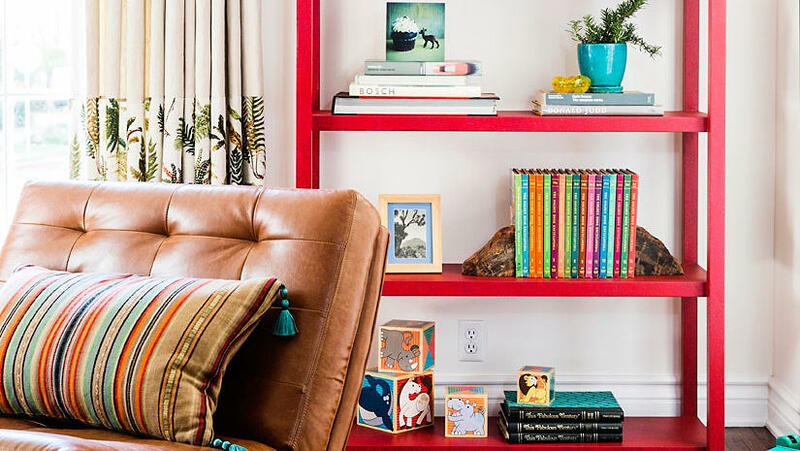 Instead of paintings, red custom shelves fill a wall in the living room. “We decided to OD on color,” says Kane. Many items displayed were chosen to reflect the nature-themed curtain fabric and the wallpaper in the neighboring playroom. The kids’ playroom includes two white lacquer tabletops on collapsible sawhorse bases. “They serve mostly as frames for blanket forts now,” says Kane. 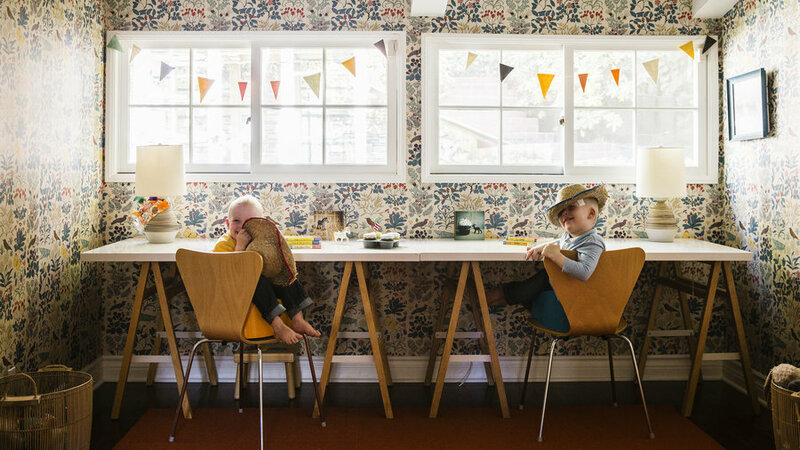 “But when the kids grow up, they’ll make great desks.” Wallpaper: Apothecary’s Garden, $7/sq. ft.; trustworth.com. 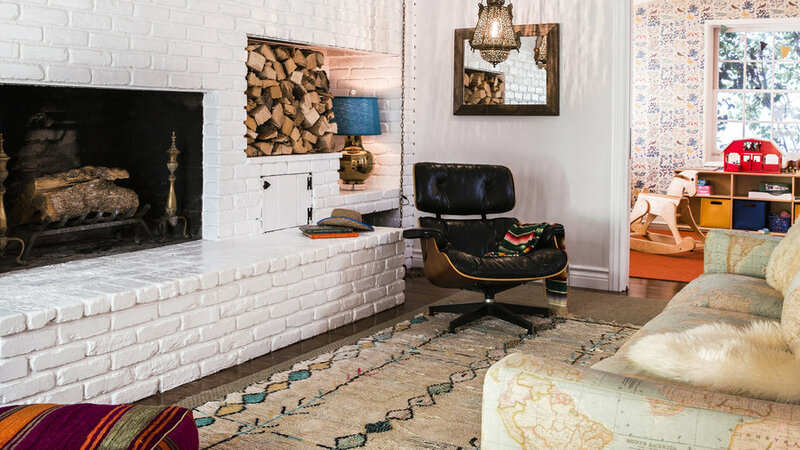 Painting the brick wall white brightened the family room and allowed Merrill to layer on a variety of patterns and styles. The designer covered a sofa with map fabric to satisfy Kane’s desire for pattern, but balanced it out with her husband’s modern lounge chair. The colors in the antique wool Moroccan rug help bring the room together. Sofa fabric: Global.1635; kravet.com for information. The windowless dining room is made even cozier with a dark green sea-grass wall covering, handmade walnut furniture, and an earthy antique Turkish rug. “We figured it’s a cave so we may as well keep it dark,” says Kane. 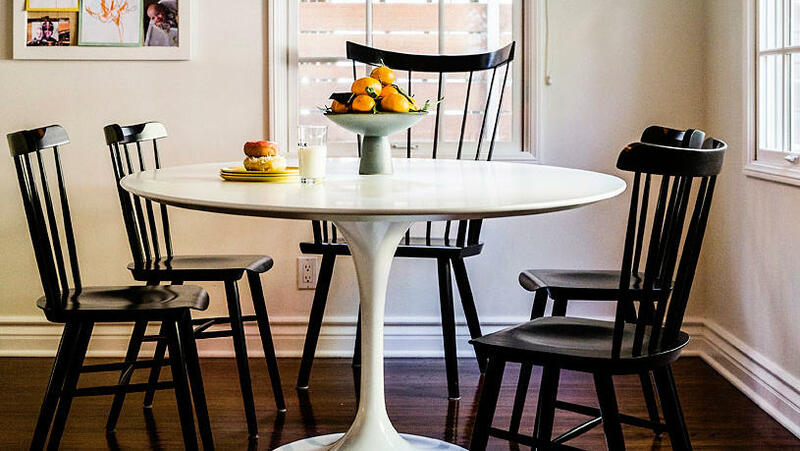 In the kitchen, oversized chairs complement the smaller shaker-style ones around the couple’s modern Saarinen table. 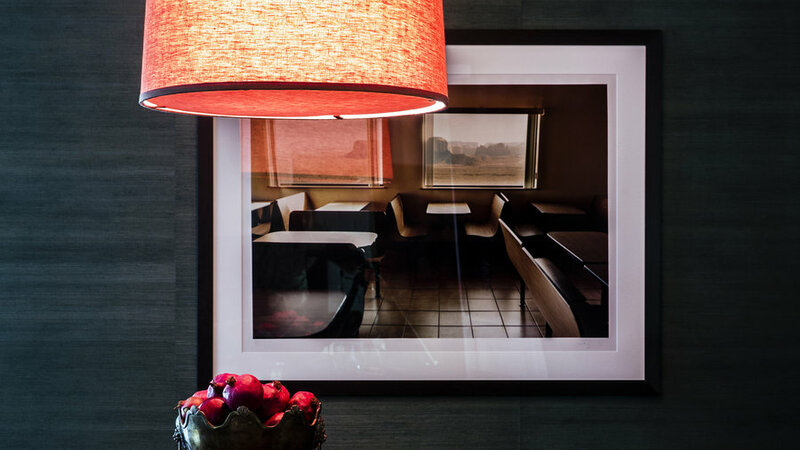 Behind this casual eating nook, two bulletin boards display a rotating collection of kid art. Salt Chairs in black, $99 each, dwr.com; Colt Highback Armchair, oandgstudio.com.